MOSCOW, July 28. /TASS/. Football fans from other countries holding the so-called Fan-IDs from the FIFA World Cup will be able to enter Russia without visa until the end of 2018 as the Federation Council (upper house) has passed a respective bill at a plenary session on Saturday. Leaders of all four State Duma’s (lower house) factions and its head Vyacheslav Volodin initiated the bill. Russia selected 11 host cities to be the venues for the matches of the 2018 World Cup that was held in the country in the period between June 14 and July 15. After the final match of the 2018 FIFA World Cup in Moscow on July 15, Russian President Vladimir Putin announced that foreigners with Fan-IDs should be granted the right for a multiple entry into Russia throughout this year without obtaining the required visas. 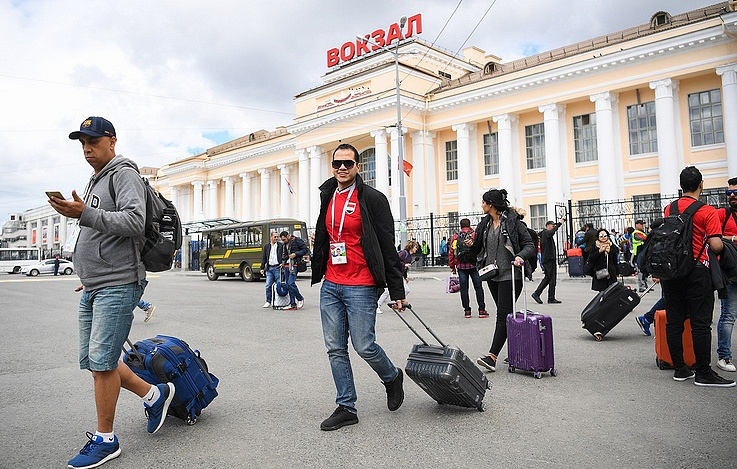 According to Chairman of State Duma’s Committee for Physical Culture, Sports, Tourism and Youth Affairs Mikhail Degtyarev, "around 80% of fans would like to return back to Russia, get familiar with the Russian culture, see the Russian hinterlands, nature, smaller towns." "We are speaking about one million of foreigners, which is a major increase in the tourist flow. They all are going to invest funds in the hospitality sector, which will be positive for the development of small and mid-sized businesses and the economy in general," he said. Russia came up for this FIFA World Cup with an innovation, which is the so-called Fan-ID and it was required for all ticketholders. This innovation was successfully tested during the 2017 FIFA Confederations Cup in Russia and earned high marks from the world’s governing football body. A Fan-ID holder was allowed to enter the country without having a Russian visa and stay for the duration of the global football tournament. Fan-IDs were obligatory, in addition to purchased tickets, in order to attend matches of the 2018 World Cup tournament in Russia.